ICE is happy to announce the opening of a ship design office in Split, Croatia. Steinar Draegebo, ICE Chairman & CEO, says that the idea for a permanent ICE presence in Croatia originally came from the owner of the local Brodosplit shipyard; however, the intention is to provide high-quality design and engineering services not only to regional companies but also to customers world-wide, as an integral part of the ICE Group. Mate Lukas, a highly respected Croatian naval architect, has joined ICE as head of the new office. As soon as ICE’s new waterfront offices are fitted out Mate will gradually build up a multi-skilled staff, which initially will work closely with ICE’s Romanian and Isle of Man subsidiaries to ensure effective transfer of the Group’s procedures and know-how. The official opening of the new ICE office will be announced later, when all formalities are in place. 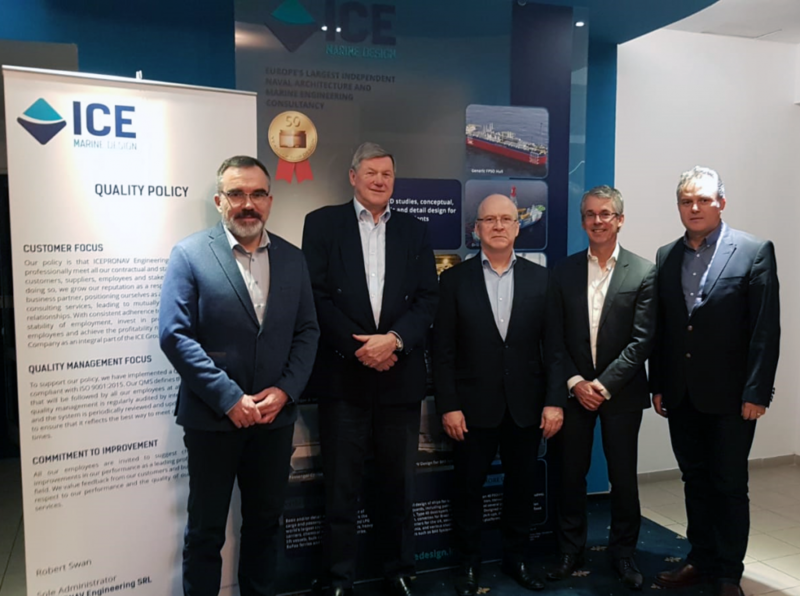 From the left: Mate Lukas with his new ICE colleagues Steinar Draegebo, Robert Swan (President & COO), Coen Landa (Business Development Director) and Sorin Brazdis (Director of Operations).